NJ Pest Control will be the leader in providing an environmentally responsible and superior service. Our Company will grow by adhering to the highest standards of performance and professionalism. Our ultimate goal is to be recognized as the best service company in our industry. 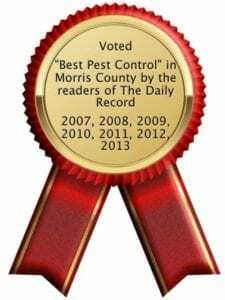 We provide S. E. R. V. I. C. E.
We are committed to Total Customer Satisfaction as evidenced by our being voted Best Exterminator in Morris County in 2007, 2008, 2009, 2010, 2011, 2012 and again in 2013. We provide the most comprehensive, reliable and courteous service you’ll find from any service company, with fast and effective response to your needs. Referrals are our largest source of new clients, because our residential and commercial customers are so happy with the results of our pest control service. Because we get the job done right the first time, our costs are always lower than many other companies that focus on their low cost rather than effective treatments that eliminate your problems the first time. Our technicians are the best in the industry, and as we mentioned before, we pride ourselves on continuing education. Additionally, each NJ Pest Control technician reports to a drug-free work place and clears a thorough background check. This emphasis on honesty and integrity is what sets NJ Pest Control above the rest. When you think of pest control, do you think of pesticides first? Most people do, but with NJ Pest Control, you don’t have to. We adhere to an environmentally conscious IPM approach that offers minimal use of chemicals with maximum results. We are also almost a completely paperless company. Every day, we build on our experience in safe, effective pest control with service that exceeds expectations. We constantly invest in the future by training our employees in the latest pest control technology, techniques, and solutions.